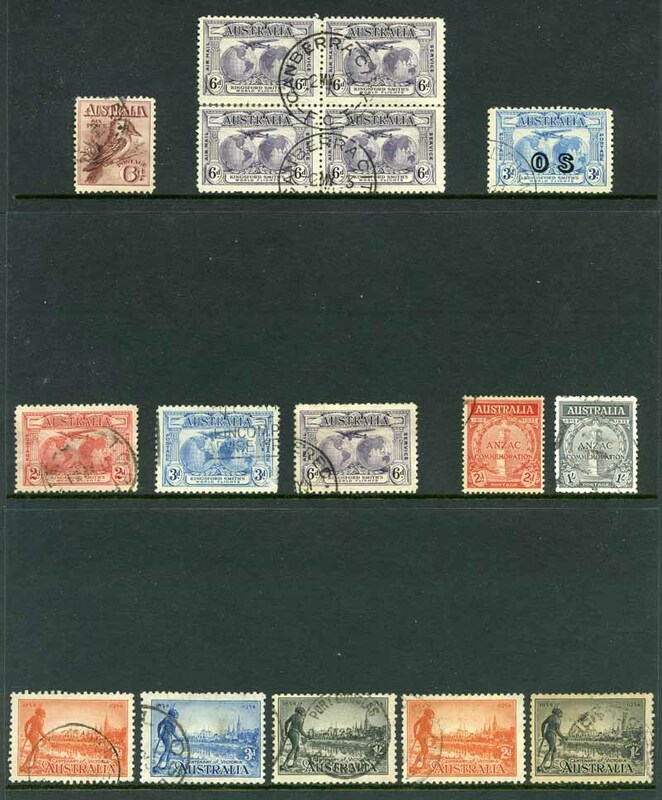 Collection of used Pre-Decimal stamps from 1913 to 1958 including range of Kangaroo and KGV issues with some handy items. Usual variable condition. 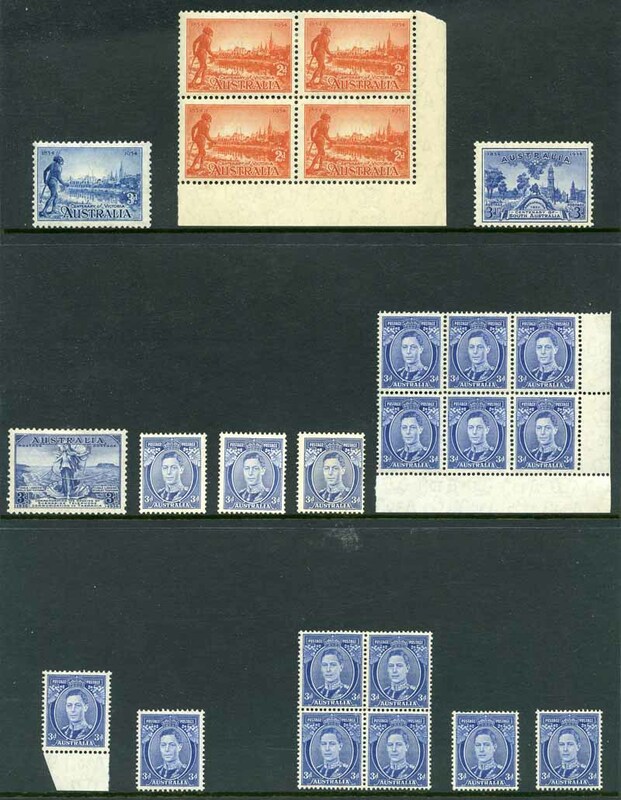 Selection of 106 MUH, MLH and used Pre-Decimal stamps from 1914 to 1965 including 1914 6d Claret Kooka FU, 1927 1½d Canberra perforated OS block of 4 MUH, 1931 3d Blue Kingsford Smith O/P OS CTO, 1931 6d Brown Airmail imprint strip of 3 MLH, 1938 3d Blue Die II Thin Paper block of 6 and Die III block of 4 MUH, 1949-50 Arms set MUH and many other handy items, plus 1971 Christmas block of 25 FU. Odd minor fault. Collection of over 1,800 different used Decimal stamps from 1966 to 2014, including numerous sets and higher values, plus small range of Pre-Decimal issues in large Chinese stockbook. Small accumulation of used Australian States, Kangaroo's, KGV and early Pre-Decimal issues, sorted into envelopes in small box. Noted 1914 6d Claret Kooka (18). Also bundle of mostly modern Australian FDC's in shoebox. Collection of mint Pre-Decimal and Decimal issues from 1927 to 2007 in Safe Hingeless album in 6 binders with slipcases. Includes handy range of early issues and largely complete MUH Decimal collection including 1971 Christmas block of 25 and Australian Antarctic Territory. Face value of Decimal issues $1,722.00. Accumulation of 14,300 commemorative and 16,300 definitive Decimal stamps in bundles of 100 from 1966 to 2010, with strength in the 1980's and 1990's, plus small range of Pre-Decimal bundles of 100. 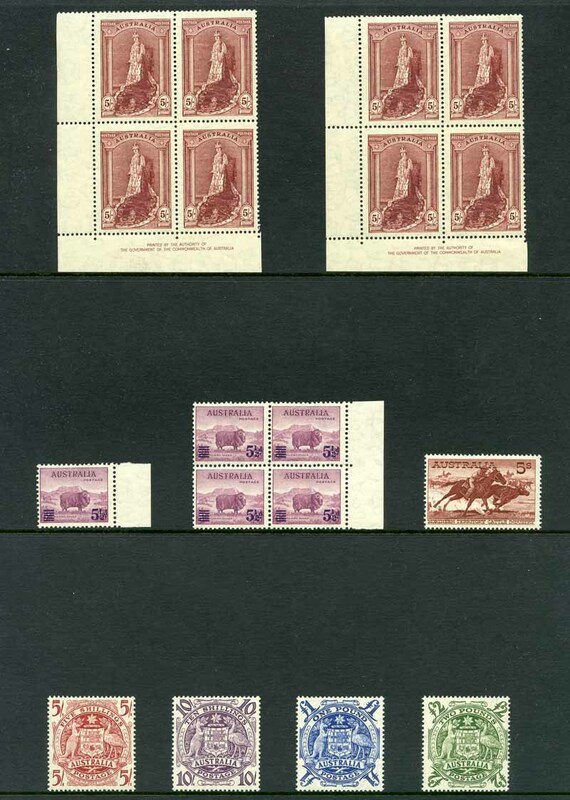 Some sets and several bundles contain well over 100 stamps. Accumulation of 18,000 commemorative and 1,600 definitive Decimal stamps in bundles of 100 from 1979 to 1988. Some duplication. Accumulation of 2,950 mostly Decimal fine used above letter rate definitive stamps, off paper. 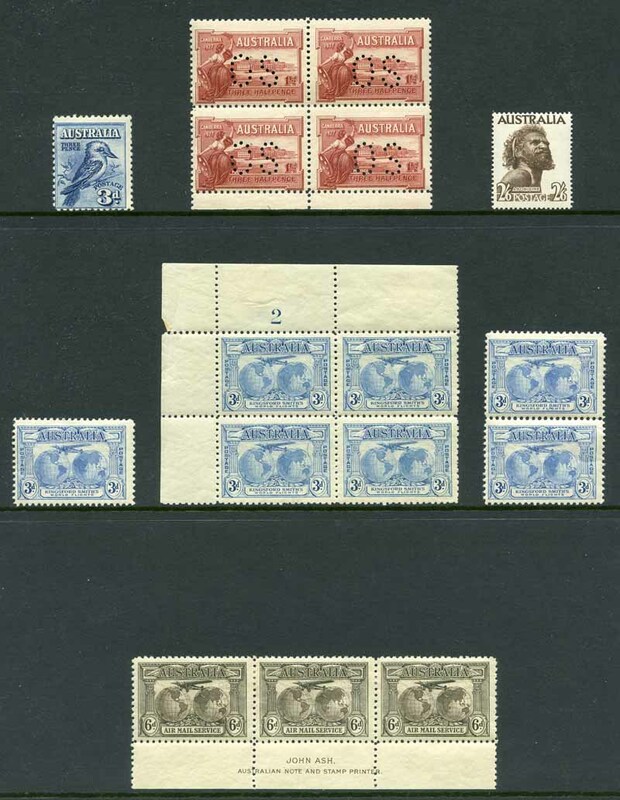 Accumulation of mint and used Pre-Decimal and used Decimal stamps in packets and on album pages, plus used Papua New Guinea accumulation in stockbook and small range of Foreign stamps. Noted 1918-22 4d Blue, 5d Chestnut and 1/4 Blue Single Wmk KGV mint hinged. 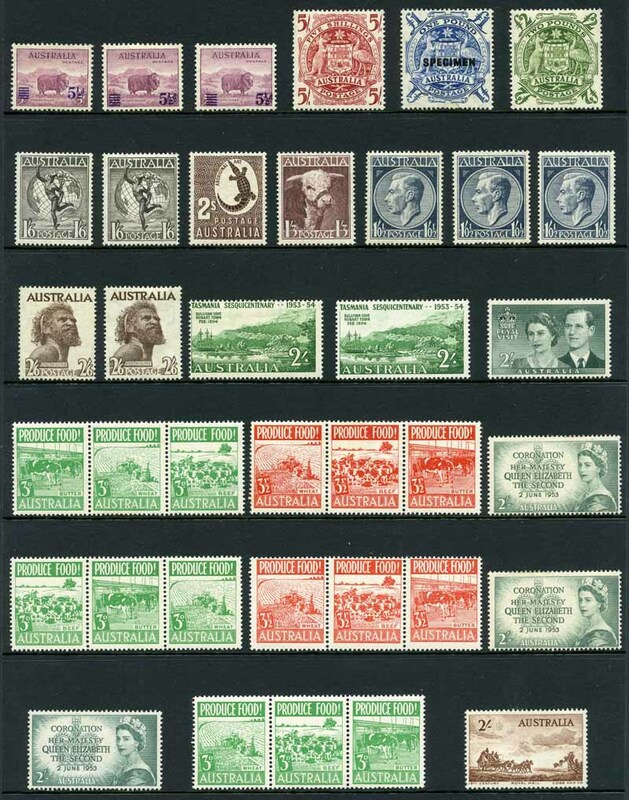 Collection of mostly used Pre-Decimal stamps from 1927 to 1940, plus a range of Australian States, Kangaroo, KGV and early Great Britain issues in small stockbook and on album pages. 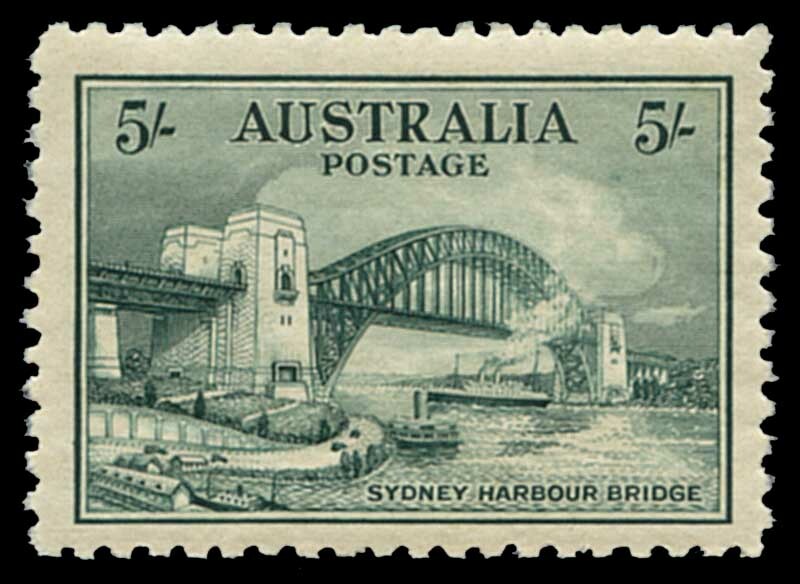 Noted 1932 5/- Green Sydney Harbour Bridge MLH with small thin. Comprehensive collection of used Kangaroo, KGV, Pre-Decimal and Decimal stamps from 1913 to 1999 on album pages. 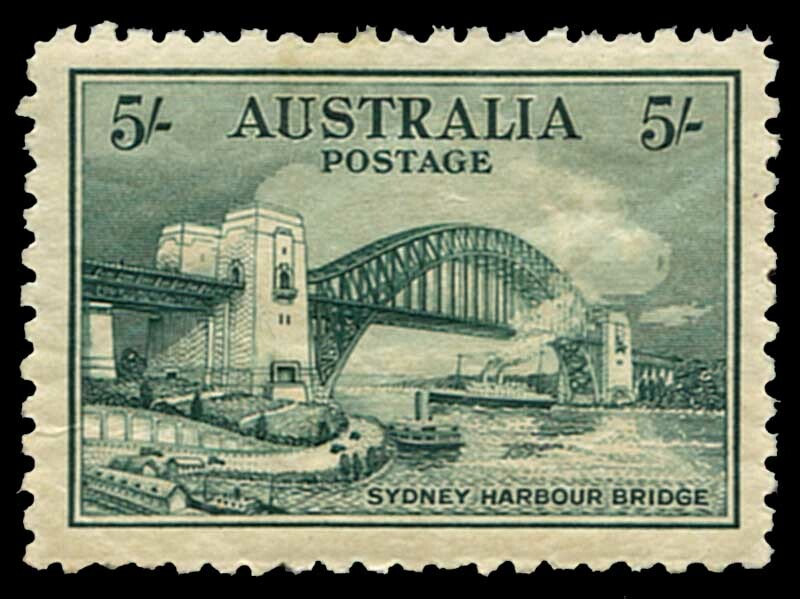 Noted Kangaroo's to 10/- value, KGV collection of 71 stamps (excludes 1d Green Die II only) and largely complete from 1914 6d Claret Kookaburra onwards including 1931 2d and 3d Kingsford Smith O/P OS (CTO), 1932 5/- Sydney Harbour Bridge (CTO), 1938-49 Thick and Thin Paper Robe sets, 1963-64 Navigator set and many other handy items. Mainly good to fine used condition with odd fault. 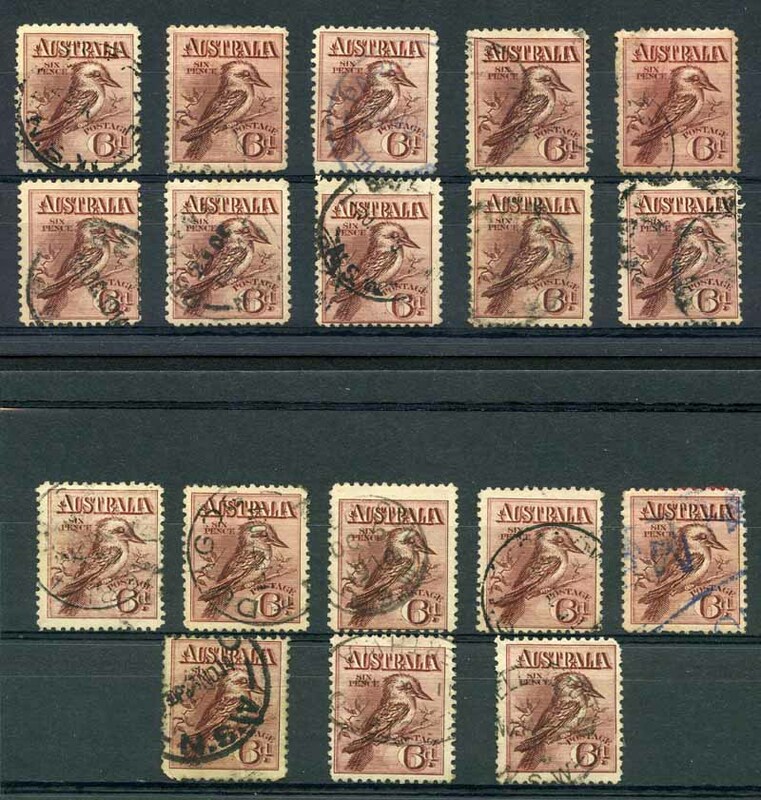 Collection of used Pre-Decimal and Decimal stamps from 1914 6d Claret Kookaburra to 2006 Australian Wildflowers set in KEK stockbook. 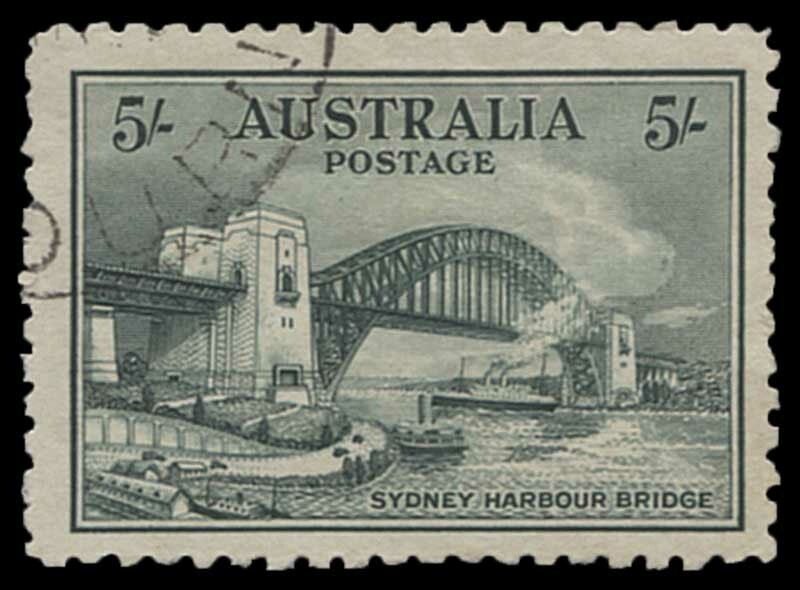 Noted 1932 5/- Sydney Harbour Bridge (CTO), 1963-64 Navigator set and many other handy items. Mainly good to fine used condition with odd fault. Accumulation of used Australian States, Kangaroo, KGV and Pre-Decimal stamps off paper, sorted into packets in shoebox. Selection of 138 mint Pre-Decimal issues from 1928 to 1965, including 1928 3d Blue Kooka M/S (2), 1932 1/- Lyrebird, 1935 2/- Silver Jubilee, 1940 6d AIF (3), 1946 BCOF set (mint without gum), 1950 £2 Arms, 1963-64 Navigator set including additional £2 value and other handy issues. Mainly lightly hinged with some minor faults. 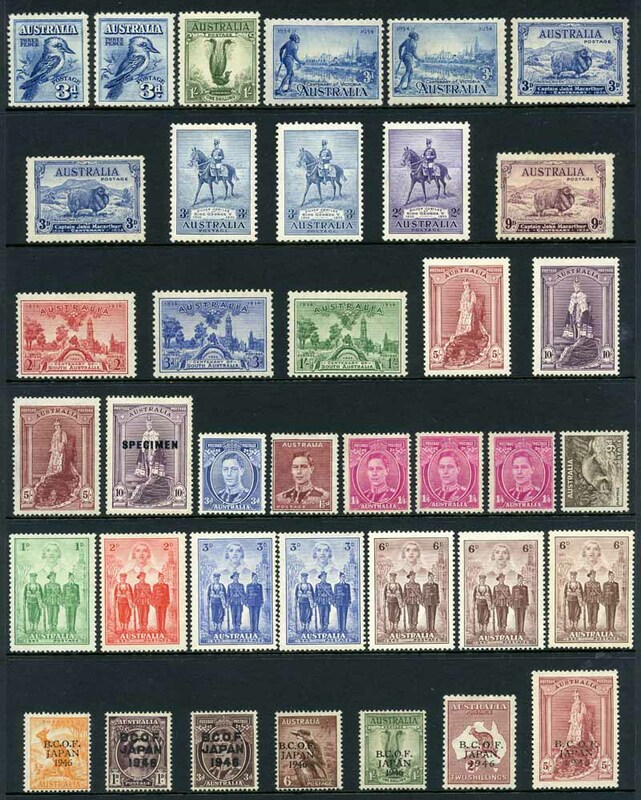 Collection of over 1,700 different used Decimal stamps from 1966 to 2014, including numerous sets and higher values, plus a small range of Pre-Decimal issues in large Chinese stockbook. Accumulation of 53,400 FU Decimal stamps in bundles of 100 from 1966 to 2001 in shoebox. 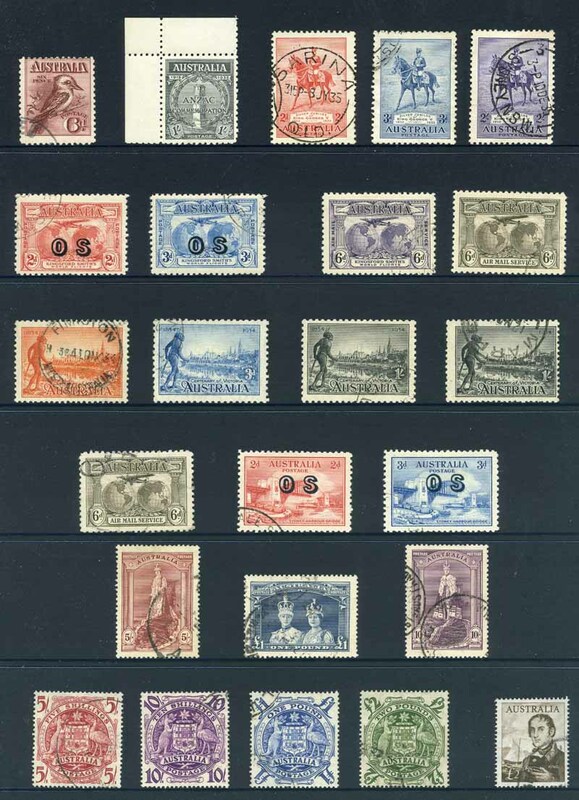 Mostly commemorative issues, but includes a proportion of definitives and few mixed bundles. Accumulation of 3,000 VFU modern Decimal commemorative letter rate stamps off paper. Accumulation of over 50,000 used Decimal commemorative letter rate stamps from 1966 to 2006, off paper in 4 shoeboxes. 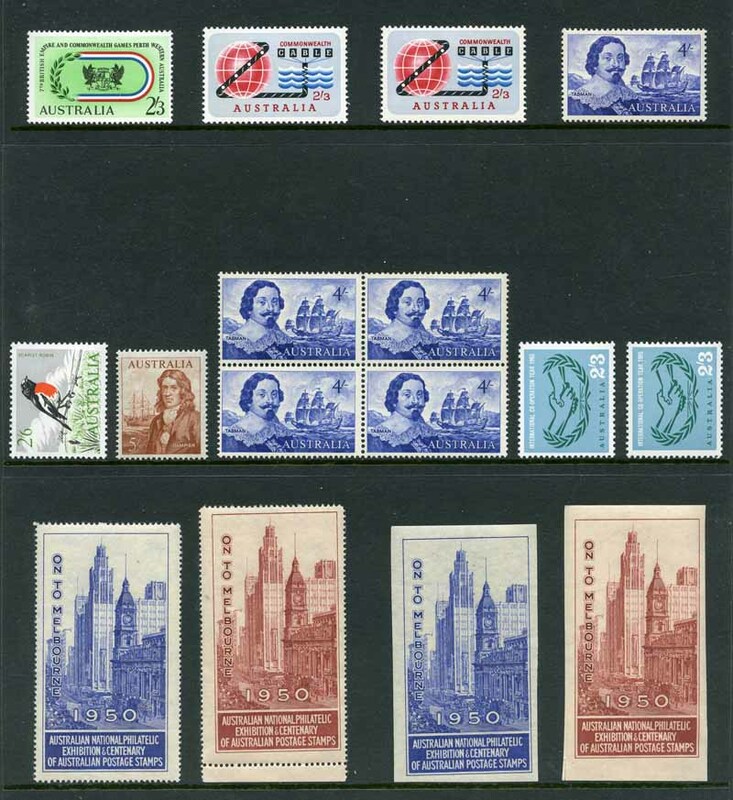 Accumulation of thousands of used Decimal stamps from 1966 to 2003 including many higher value commemorative issues and large quantity of sets, in 7 large Chinese stockbooks. 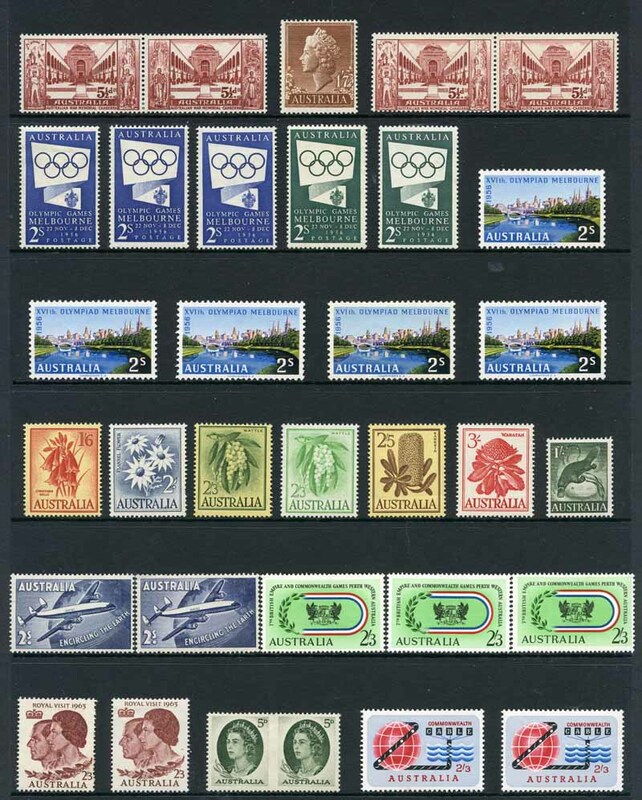 Collection of MUH stamps from 1927 to 1973 including 1927-30 perf OS commemorative set (1928 3d Kookaburra MLH), 1931 Kingsford Smith set, 1932 6d Brown Kookaburra, 1934 Victorian Centenary set, 1934 1/6 No Wmk Hermes, 1936 South Australian Centenary set, 1937 New South Wales Sesquicentenary set, 1940 AIF set, 1959-64 Flowers set, 1963-64 Navigators set to 10/- value, 1964-65 Birds set, complete basic Decimal set from 1966 Definitives to 1973 Architecture set and Australian Antarctic Territory complete collection from 1957 Definitives to 1972 Cook set. Odd fault. Accumulation of many thousands of used Pre-Decimal stamps, mainly off paper including handy items and some mint content in small carton. Also range of MUH Decimal issues (Face value $156.00) and several covers. Shoebox containing accumulation of 1930's era on paper mixture including some KGV head content. 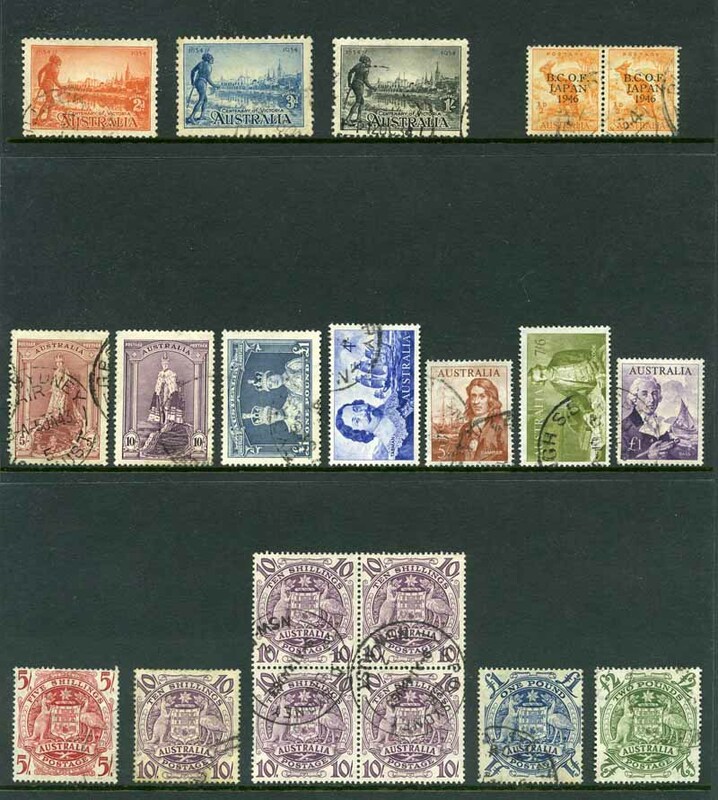 Collection of good to fine used Decimal stamps, from 1966 to 2014, including many higher value commemorative issues and numerous sets, in KEK stockbook. Accumulation of thousands of mostly used Pre-Decimal and Decimal stamps from 1927 to 2007, plus range of Australian States, Kangaroo and KGV issues in 2 Lighthouse stockbooks. Varying duplication. 2013 60¢ Government Houses (1,000), 2013 60¢ Headline News (1,000), 2013 60¢ Historic Railway Stations (1,000), 2014 70¢ Bush Ballads (2,000), 2014 70¢ Equestrian Events (1,000), 2014 70¢ Nostalgic Advertisements (1,000), 2014 70¢ Australian Racecoures (1,000) and 2015 70¢ Tourist Transport (1,000) Peel and Stick sets in bundles of 100 good to fine used. Accumulation of 4kg of mostly Decimal used stamps off paper in carton. Also Foreign off paper accumulation in shoebox. Accumulation of mint and used stamps from Australia and Territories in various albums and boxes including a handy range of used Kangaroo and KGV issues with listed and unlisted varieties, basic collections in Seven Seas albums including a 1932 10/- Grey and Pink C of A Wmk Kangaroo good used, a selection of mostly 1970's and 1980's stamps on piece with CDS postmarks, First Day covers with a face value of $127.00, Mint PSE's (201), PSE's cancelled on FDI or with special postmarks (188), 1981 Brown series III Postcard packs (5), Aerogrammes and more. Some faults and toning. Accumulation of tens of thousands of used Decimal stamps off paper, from early to modern in wine carton. Some Pre-Decimal content. Weight 5kg. 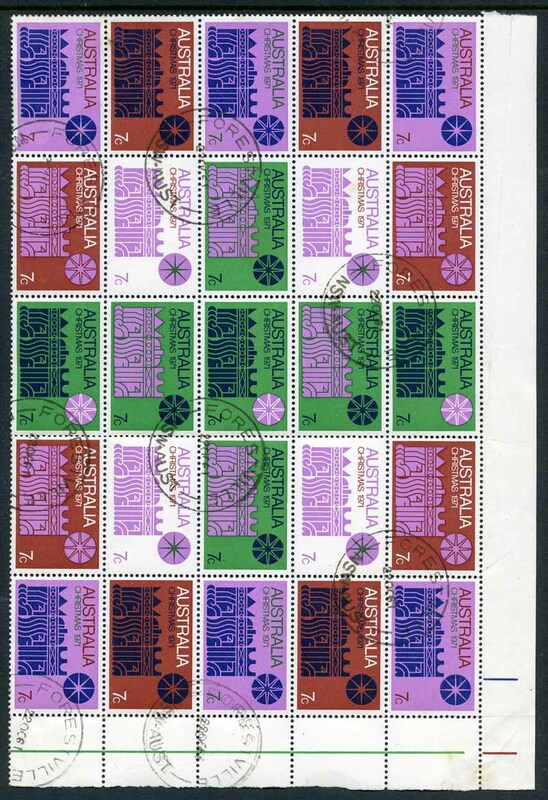 Accumulation of 1,077 used stamps on Hagner sheets including numerous higher values and a range of International stamps, with some modest duplication. Collection of many hundreds of mostly good to fine used Pre-Decimal and Decimal stamps from 1913 to 2003 in 3 Hagner albums, plus off paper mixture and small of FDC's in shoebox. Noted 1914 6d Claret Kookaburra, 1932 2d and 3d Kingsford Smith O/P OS (CTO), 1935 1/- Anzac (MUH), 1935 Silver Jubilee set, 1938 Thick Paper Robe set, 1964 £2 Navigator and a handy range of Decimal issues. Mainly fine with some duplication. 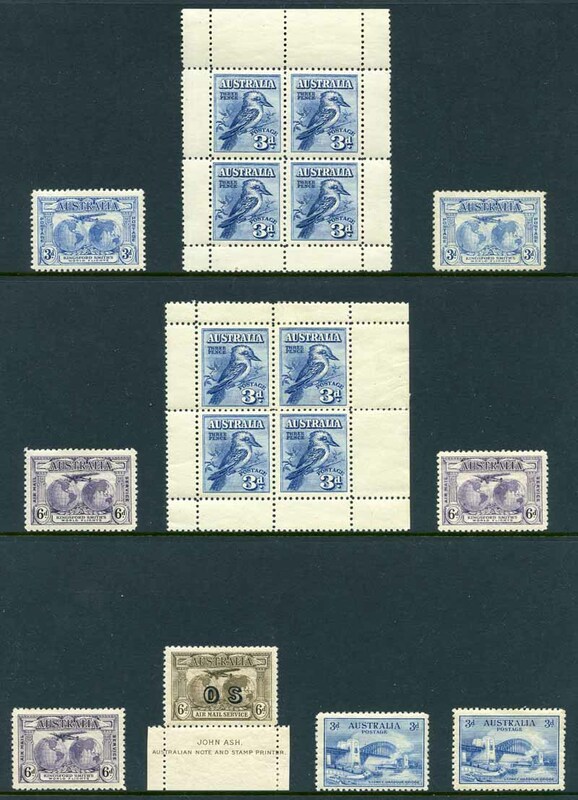 Accumulation of many thousands of used Pre-Decimal stamps off paper in carton, with some KGV Head content. Also a shoebox of First Day Covers, mostly modern, but including some handy Pre-Decimal items and a few foreign, some stamps on piece and a few miscellaneous items. 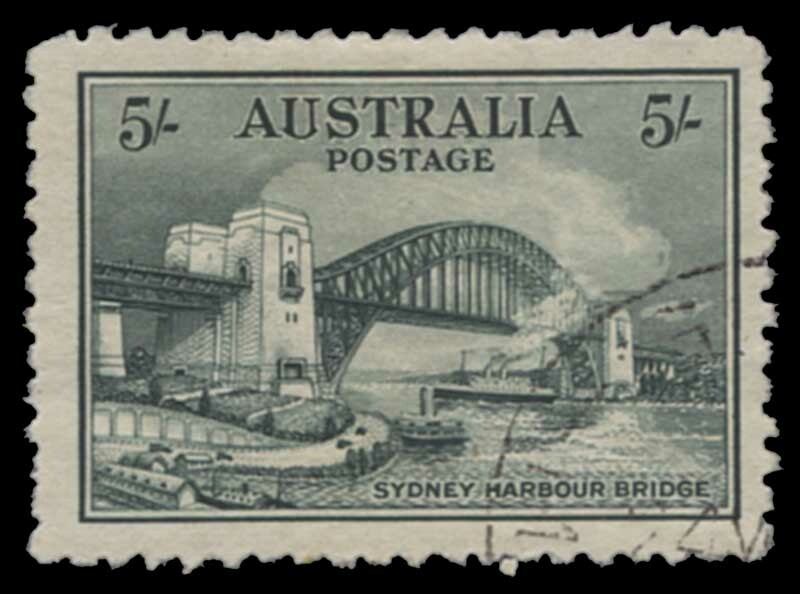 Complete MUH Pre-Decimal and Decimal simplified collection from 1927 1½d Canberra to 1980 Aircraft set in Sherwood Albums including 1928 Kookaburra M/S (light crease in margin), 1932 1/- Lyrebird, 1932 5/- Sydney Harbour Bridge (tiny tone spot), 1934 Perf 10½ Victorian Centenary set, 1934 Macarthur set, 1935 Anzac set, Silver Jubilee set, 1936 SA Centenary set, 1937 NSW Sesquicentenary set, 1938 Thick Paper Robe set, 1940 3d Blue Die III KGVI, 1940 AIF set, 1949-50 Arms set, 1961 5/- Cream Paper Cattle and 1963-64 Navigator set of 6. Odd minor fault. Collection of mint and used Pre-Decimal and used Decimal stamps from 1914 to 1974 including useful range of used Kangaroo and KGV issues in 2 loose leaf albums. Noted 1913 2½d perf small OS GU and 5/- CTO (rounded corner) 1st Wmk Kangaroo's, 1914 6d Claret Kookaburra mint and other handy items. Accumulation of tens of thousands of modern used letter rate stamps off paper in wine carton. Some uncancelled content. Weight 5kg. Accumulation of thousands of used Decimal stamps from 1966 to 1984, plus small range of Pre-Decimal issues including 1963-64 Navigator set in 3 Lighthouse stockbooks. Includes numerous sets, handy items and some Australian Antarctic Territory. Also shoebox of FDC's, covers and postal stationary items including 1975 Cyclone Tracy concession cover with red Paid slogan postmark and some Foreign content. 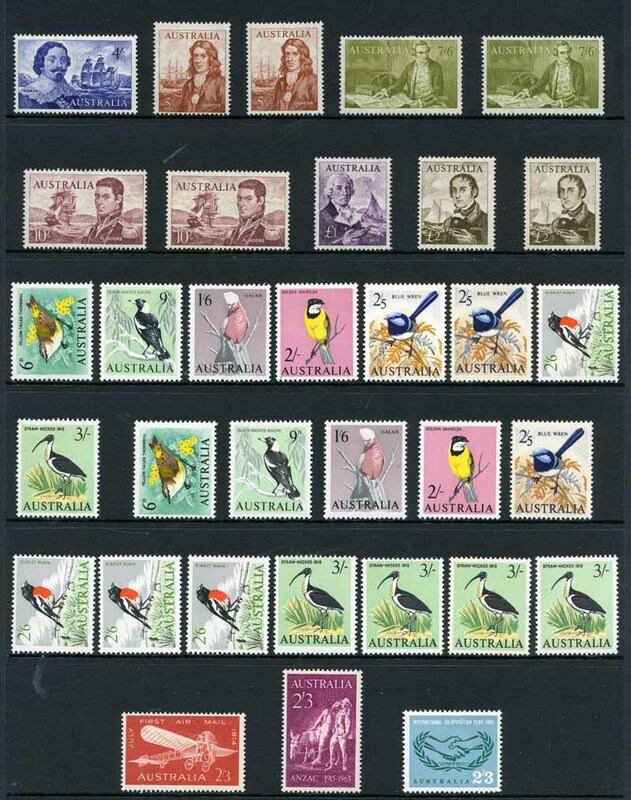 Collection of Decimal issues from 1973 to 1995 CTO with gum, including many sets and a small range Australian Antarctic Territory in 2 loose leaf albums. Some duplication. Mostly with Adelaide or GPO Melbourne cancellations. Face Value $731.00. Accumulation of 3,100 VFU modern Decimal commemorative letter rate stamps off paper. Collection of used Pre-Decimal and Decimal stamps from 1913 to 1994 in Seven Seas Junior album and accumulation of many thousands of mostly Decimal stamps off paper, many sorted into packets in 2 shoeboxes. Also Foreign collection in 2 albums, on and off paper mixture and range of covers. Selection of Pre-Decimal and early Decimal stamps on stocksheets, 213 souvenir covers cancelled with special postmarks, 178 mint Pre-Stamped Envelopes (Face Value $52.00), 297 Pre-Stamped Envelopes cancelled on First Day of issue, 1990 $5.00 Grand Prix Phone Card pack, miscellaneous range of mint and used Australia and Foreign stamps, FDC's, Maximum cards, Postal Stationery items, 2 early bookmark size "Book Post" postcards depicting Miss Gabrielle Ray and more. Also general world collection including some useful items in Tatty old Triumph album. Accumulation of 49,400 good to fine used Peel and Stick stamps in bundles of 100, including 2013 60¢ Government Houses (1,100), 2013 60¢ Carnivorous Plants (100), 2013 60¢ Historic Railway Stations (1,100), 2014 70¢ Centenary of WWI (100), 2014 70¢ Bush Ballads (2,200), 2014 70¢ Equestrian Events (1,000), 2014 70¢ Nostalgic Advertisements (500), 2014 70¢ Open Gardens (300), 2014 70¢ Things that Sting (100), 2014 70¢ Australian Racecourses (1,100), 2015 70¢ Cats (500), 2015 70¢ Collections (700), 2015 70¢ Love is in the Air (100), 2015 70¢ Tourist Transport (1,000), 2015 70¢ Native Animals (400), 2015 70¢ Lighthouses (500) and 2015 Great Australian Walks (300). Collection of used Pre-Decimal and Decimal issues from 1927 to 2014 including a handy range of early issues and some Australian States, Kangaroo and KGV content in 4 stockbooks, plus accumulation of many thousands of used Pre-Decimal, Decimal and Australian Territory stamps off paper in 2 shoeboxes, plus 1.5kg of Decimal on paper mixture. Also Papua New Guinea 1986, 1987, 1989 and 1990 Post Office Year albums. Accumulation of many thousands of used Pre-Decimal and Decimal stamps from 1913 to 2013, in 8 stockbooks and 3 large Safe albums, plus off paper mixture in shoebox. Includes range of Kangaroo and KGV issues, numerous sets and higher value commemoratives and some Australian Territory issues. Varying duplication. Accumulation of tens of thousands of used Decimal stamps from 1966 to 2013, sorted into envelopes in 3 large cartons. Numerous sets and higher value commemoratives, plus range of Pre-Decimal and Australian Territory issues. Accumulation of many thousands of used Decimal stamps with main strength in the 1970's and 1980's period, plus a proportion of Pre-Decimal issues. Accumulation of many thousands of used Pre-Decimal and Decimal stamps from early to modern in shoebox. Also Foreign used accumulation in shoebox with main strength in heavily duplicated Papua New Guinea. Accumulation of 9.5kg of mostly modern Decimal on paper mixture and off paper Decimal accumulation in plastic bag. Some Foreign content.